Official description Face off for a trophy! The prize this time: Goomba! Trophy Tussle 1 (フィギュア上の戦い１, Battle on Figure 1) is the 14th event match of the 51 event matches in Super Smash Bros. Melee. This is the first Trophy Tussle event available. In it, the player is pitted against three other characters. The player can choose any character they want to play as. Every character has two stocks, and the player has three minutes to defeat them all on a stage that is a giant version of the Goomba trophy. 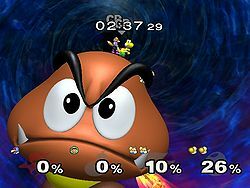 Winning this event will reward the player with the Goomba trophy that this match takes place on. This page was last edited on July 21, 2018, at 17:00.